Sammy graduated from Eastern Kentucky University with a B.B.A. in Accounting in 1989 and is a licensed Certified Public Accountant. Sammy opened his firm in 1996 and has 29 years of experience in public accounting, with emphasis in tax planning and preparation, auditing, and business consulting. He is a member of American Institute of CPAs, Kentucky Society of CPAs and the Governmental Audit Quality Center. Sammy resides in Berea with his three children, Poem, Samuel, and Micah. Connie attended Lindsey Wilson College and has 38 years experience in public accounting, with emphasis in individual and business tax planning and preparation. Originally from Danville, she started her accounting career working for her father in his accounting business. Connie joined the firm in 2001. She is a member of Berea Baptist Church and resides in Berea. She has two daughters, three grandchildren, one great-grandchild, and is raising her three great-nieces. Judy, originally from Alabama, joined the firm in 2001. She came to Berea to attend Berea College and graduated in 2000 with a B.A. in Economics. Judy obtained a Certificate in Accounting from Eastern Kentucky University and has 18 years experience in public accounting with an emphasis in financial statement preparation. Judy is a member of American Institute of CPAs, Kentucky Society of CPAs, and is a Certified QuickBooks ProAdvisor. She is a member of Church on the Rock and lives in Cartersville with her husband Travis and children Ashley and Benjamin. Heather, a 2009 graduate of Eastern Kentucky University with a B.A. in Finance and a B.A. in Accounting, joined the firm in February 2010. She has 9 years experience in public accounting with an emphasis on auditing and specializes in Governmental and HUD audits. 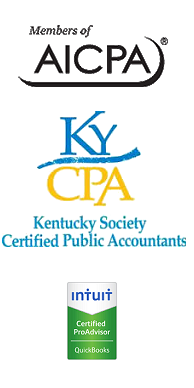 Heather is a member of the Kentucky Society of CPAs. She and Edgar live in Berea. Elaine, a Navy Veteran, is originally from Rockwell, North Carolina. She graduated from Eastern Kentucky University in 2002 with a B.A. in Accounting and has three years of public accounting experience with an emphasis in auditing. She joined the firm in October 2015 and lives in Berea with her husband and two daughters. Robyn, a native of Madison County, joined the firm in February, 2006 and is currently the Office Manager. She is a graduate of Eastern Kentucky University with a B.S. in Science in 2000. Robyn lives in Berea with her husband Kevin and daughter Shelby. Joy, originally from Minnesota, came to Berea in 1990. Joy joined the firm in June, 2012 and has 20 years experience in public accounting and is responsible for all scheduling and billing. She lives in Berea and has one son, Cameron. Susan attended Eastern Kentucky University and is a graduate of Kentucky College of Business. Susan joined the firm in August 2006 and is a bookkeeper with emphasis on accounts payable and payroll. Susan lives in Berea with her husband Earl. She has three daughters and six grandchildren.